MANCHESTER AND REGION is a fascinating subject for artistic representation, in my opinion much more interesting than traditional-style 'chocolate box' subjects. For hundreds of years, artists have captured Manchester and the towns and areas around it in drawings and paintings. You'll find many examples of their work at places such as the City Art Gallery, currently undergoing major renovation, the Whitworth Art Gallery, Salford Art Gallery and Museum, The Lowry, the excellent municipal galleries in the surrounding towns, as well as a growing number of private galleries. Adolphe Valette, LS Lowry and Harold Riley are among the best known artists who were active in the local area during the 20th century. Since the dawn of photography in the 1840's and 50's, photographers have documented the city as well. You can see their work in the Local Studies Unit of Manchester Central Library, and in many local interest publications. Contemporary photographers of Manchester include Len Grant, Manchester Evening News photographers Mike Grimes and Howard Walker, and the highly talented Jan Chlebik, who used to be in the same class as me at Xaverian College grammar school. In future updates of Eyewitness in Manchester, I hope to showcase these artists and photographers, and their work. On this page I introduce one of Manchester's best known and most successful artists, Liam Spencer, who I had the pleasure of meeting at his current exhibition at Tib Street Gallery. I place some of his paintings side by side with my photographs of the same motif. I also present a selection of other paintings and drawings, and recommend a new book of LS Lowry's paintings. FEATURED ARTIST LIAM SPENCER graduated from Manchester Polytechnic (now Manchester Metropolitan University) in 1986 and has been a full time professional artist ever since. Currently, his main subject matter is Manchester and as as a result of his exhibition at the Lowry in 2000, he has achieved the highest profile of any contemporary Manchester artist. Using a palette of pinks, purples, blues, and yellows, Liam Spencer's paintings magically capture the changing moods and atmospheres of contemporary Manchester and Salford. Like a photograph, they faithfully render the layout and overall appearance of the location, but when you zoom in close, you enter an abstract world of pure colour, applied in deft brush strokes by the artist in his Strangeways studio. CASTLEFIELD is captured here in a painting by Liam Spencer looking towards Deansgate and the Quay Bar. The cranes on the right signal the construction during 1999 and 2000 of a new complex of luxury apartments overlooking Chester Road CASTLEFIELD is pictured here in a photograph taken in August 1998. On the right is the Quay Bar and on the left the renovated warehouse which is now home to leading architects Roger Stephenson. CASTLEFIELD BASIN is seen here in a panoramic painting which bears a striking similarity to a panoramic photograph I took in 1997. The field of view is almost identical, spanning 180 degrees and including the canal towpath in both directions. On the left is the Bridgewater Canal leading to Trafford Park with a branch to Worsley and one to Sale, Altrincham and Runcorn. On the right is the new metal footbridge whose curves echo the late 19th century railway bridge. CASTLEFIELD BASIN is captured here in this panoramic photograph which I took in 1997 using the Horizont panoramic film camera. The field of view and the viewpoint is almost the same as in Liam Spencer's painting, undertaken independently of this photograph some three years later. The canalside area of Castlefield lay derelict and virtually abandoned until it was transformed by regeneration during the 1980's. Former bookmaker Jim Ramsbottom was a leading light in the regeneration of the area. 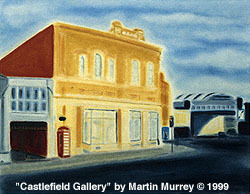 CASTLEFIELD GALLERY, Upper Campfield Market is the subject of this painting by Martin Murrey, friend and associate of Liam Spencer. Both artists feature Manchester and use the same studio space in Strangeways. 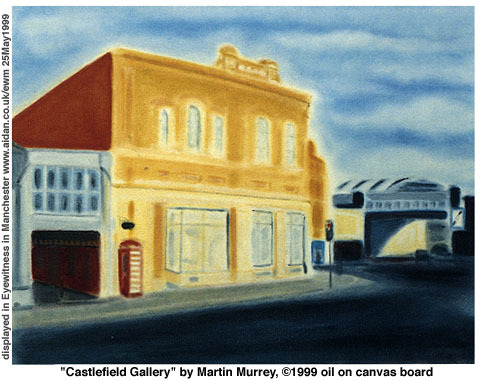 This painting by Martin Murrey displays familiar characteristics of the artist's worok - a 'halo' effect round the building, use of very deep blues, and a lack of people or traffic, imbuing the scene with a magical, dream-like quality. The bridge which carried railway tracks leading from the Great Northern Warehouse was still in place at the time Martin did this painting. 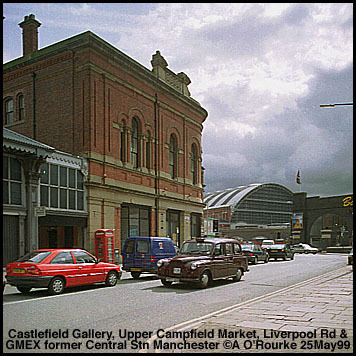 CASTLEFIELD GALLERY, Upper Campfield Market is seen here in this photograph taken May 1999. The gallery is located on the ground floor of the building to the right of the phone box. Manchester artist Martin Murrey had an exhibition here during May 1999. Here at the junction of Liverpool Road (in front of us), Deansgate and beyond the lights, Great Bridgewater Street there is plenty of traffic, including a Manchester black cab, actually painted a very dark brown. The removal of the Great Northern Warehouse railway bridge has revealed the southern end of GMEX, the former Central Station. This view is to be obscured again by the construction of a new building, part of the Great Northern leisure complex during 1999 - 2001. MANCHESTER TOWN HALL has been drawn, painted and photographed innumerable times since it was opened in 1874 (architect: Alfred Waterhouse). 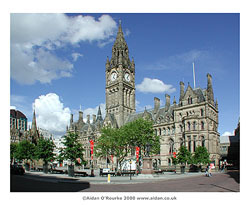 It's one of Manchester's most magnificent buildings, a Victorian exercise in neo-Gothic splendour. The exterior stonework was cleaned in the 1970's, though weather and air pollution have started to darken it again. 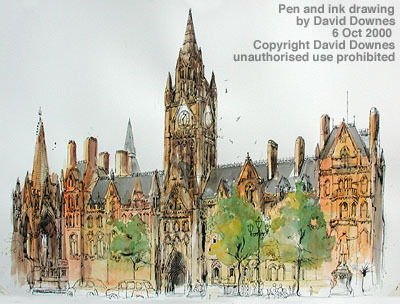 Here it is seen through the eyes of artist London-based artist David Downes, who on 6 October 2000, I saw working at one of the outdoor tables of Via Vita restaurant, on Albert Square. Alfred Waterhouse's creation might have been demolished - Manchester Corporation's 1945 plan for the redevelopment of the city mentions the possibility of it being 'taken down' in order to make way for a larger building. ART AND PHOTOGRAPHY merge in these versions of a sunset over Strangeways and Salford. Unique atmospheric conditions combined to create an enchanting visual effect, with colours reduced by the haze to shades of blue. The upper picture is an alternative version, where the sun has started to move behind the chimney - it was taken a few seconds after the lower versions. I've given it a 19th century 'magic lantern' quality by curving the corners, darkening the image, adding some vignetting (i.e. lighter at the centre, darker at the edges an effect found with older cameras), reducing the size and making a wide black background. One Eyewitness in Manchester reader suggested this image would make a good stamp, so I've made an alternative version in 'postage stamp' format. As a child I was fascinated by a Polish stamp with a line illustration of a layered, stepped back city skyline. A medieval style tower looked similar to that of Strangeways prison and in my own mind I imagined the scene to be Manchester. Since then I've wanted to capture Manchester in this way and in this photograph, I think I've done it. THE OLD FOOTBRIDGE OFF COLLYHURST ROAD over the railway line from Victoria Station is imaginatively portrayed here in this charming drawing by William K Jones. He has drawn it as he remembers it from his childhood in the 1930's, and it's mostly unchanged from the 1900's when his mother grew up close to here. In those days , lots of children used to play out on the streets, and many were fascinated by the steam engines which used to huff and puff not far from their homes. As a child in the early sixties, I loved to stand on the footbridge near Cheadle Heath Station and wait for the steam engines to pass underneath. The age of steam ended a few years later, so I was lucky to experience it. You can rediscover the fascinating and poignant world of inner Manchester in the first decade of the twentieth century through Bill Jone's excellent narrative "On Looking Back", illustrated with his vivid and humorous pencil drawings. You'll find them at www.manchester-stories.co.uk. 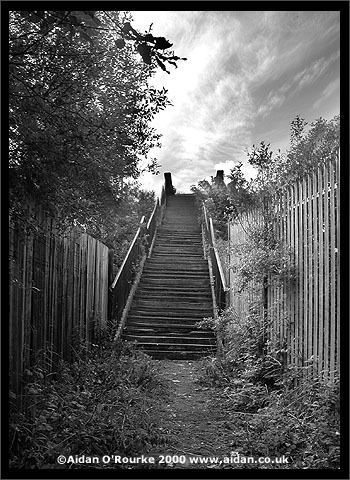 THE OLD FOOTBRIDGE OFF COLLYHURST ROAD is in the year 2000 delapidated and deserted, with an almost ghostly quality. The bridge is still open to the public, though the steps are in urgent need of repair and are potentially dangerous. Trains haven't passed under the bridge for years - the lines are now disused and serve as a car park. It's interesting to compare the bridge as recorded today with Bill Jones' recreation of it from his imagination. The central railing is still there, though the right hand side has been closed off and is covered in weeds. He has included gas lamps, but omitted the three wider areas on the way up the steps. The wooden fence is still there, though the metal fence on the right is a recent addition. MY FEATURED BOOK, LOWRY'S CITY was published in 2000 to co-incide with the opening of the new arts centre which bears the name of Salford's, and Manchester's most celebrated artist, L. S. Lowry. Some of Lowry's most famous paintings are here, presented side by side with his drawings of the same subject. Archive photos and contemporary ones captured by Len Grant, provide further comparisons. The locations are well documented by authors Judith Sandling and Mike Leber. St Augustine's Church, St Michael's Church, Peel Park, Swinton, Crime Lake, Daisy Nook, Stockport and Mottram in Longdendale are some of the places featured. The authors have included maps showing the modern district and area boundaries. It would have been nice to include old street maps - a suggestion for future editions perhaps. LS Lowry's paintings and drawings allow us to rediscover the old Manchester, a Manchester that anyone born after the 1960's won't remember. Nowadays, the name "Lowry" has taken on the aura of a designer label, and has a radiant, beacon-like quality. It's the name of an arts centre, a new five star hotel, a firm of builders and a rather ugly post-war office next to the main post office on Spring Gardens. I wonder what the old man would have made of the widespread use of his name after his death in 1976. I'LL BE FEATURING more artistic representations of Manchester in future Eyewitness updates, and maybe I'll get a pencil and paper myself one of these days, and try a bit of sketching. Though photography is an art form in itself, drawings and paintings are more highly sought after as prints, so maybe it ill be worth my while.